With the Republican supermajority broken in both chambers of the North Carolina Legislature following the 2018 election, 2020 will be a crucial election for both Democrats and Republicans. Republicans will be looking to hold onto their majorities, while Democrats will need to work hard to hold onto the gains they’ve made while expanding into new areas. In addition, despite their crucial role in post-census redistricting, legislative races will have to compete with Presidential, Gubernatorial, and US Senate races for attention. Following is our initial look at the 28 House and 17 Senate districts we think will be crucial to the 2020 legislative elections. These districts were chosen based on analysis of 2018 election results and campaign finance reports, as well as long-term district data. In the coming weeks, look for a full report with details on incumbents and their district with reports on Council of State and State Supreme Court races to follow. These Races to Watch are an an initial look at the 2020 landscape. Redistricting litigation is ongoing at the state and federal levels and the Wake County House districts will need to be redrawn before the next election. Due to this and a number of other factors this list is likely to change as the election approaches. We are one year out from a new census and just one month past an election that saw an increase in candidates of color and female candidates. Using census information from 2000 and updated estimates, we’ve compiled some comparison graphs to see how diverse the General Assembly is compared to the population of the state. As of 2000, the population of the state of North Carolina was 8,049,313. The latest population estimate from 2017 indicates that the state grew by a little over two million people over 17 years. Though there were shifts toward better representation of NC’s population by its elected officials, there is still a lot of room to grow. For example, according to 2017 US Census Bureau estimates, Hispanic/Latinx people make up 9.5 percent of NC’s population, but there are no NCGA members who identify as Hispanic or Latinx. 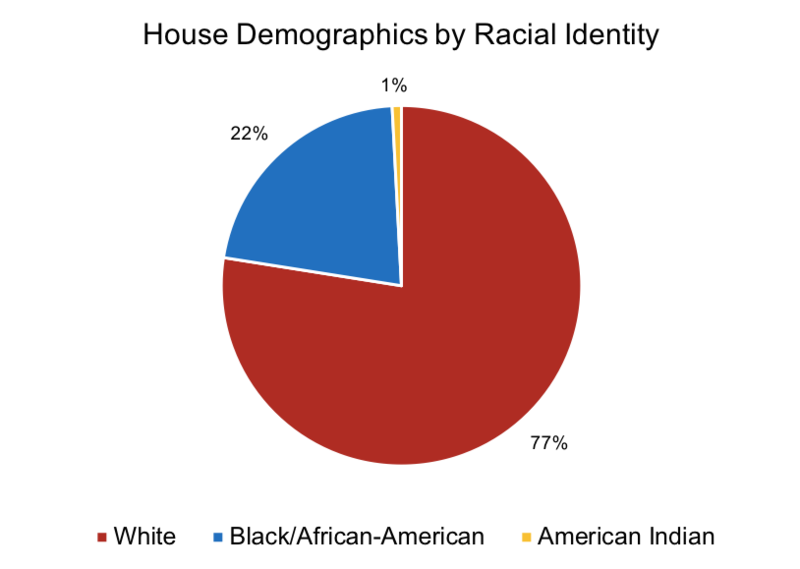 White people are still overrepresented in the state legislature as they occupy only 63.1 percent of the state’s population, per 2017 estimates, but more than 70 percent of both legislative bodies. Real Facts NC released a report today on key NC races in the 2018 midterm elections. Tuesday’s results included major victories with the election of Anita Earls to the NC Supreme Court, the defeat of the two “power grab” constitutional amendments, and the election of three Democrats to the NC Court of Appeals. Democrats also broke the Republican supermajority in the NC House and, barring two potential recounts, look to have done the same in the NC Senate. Notably, first-time candidate Julie von Haefen beat long-time incumbent and chief budget writer Nelson Dollar. Democrats defeated almost all of the incumbent Wake and Mecklenburg Republicans and picked up two Western NC House seats. Victories were dampened by the losses of close races in New Hanover County despite shifting tides in that region. Furthermore, four constitutional amendments passed, including the photo ID requirement to vote. A similar measure was previously ruled unconstitutional in 2016 for targeting African American voters “with almost surgical precision.” It is widely expected that Republican lawmakers will attempt to codify some of the same restrictions on acceptable IDs when they return to write the implementing legislation in late November. The right to hunt and fish and the victim’s rights amendments also require implementing legislation. Some of Tuesday’s results made history, including the election of Pitt County’s first Black District Attorney Faris Dixon and first Black woman Sheriff Paula Dance. In Wake County, Gerald Baker overcame great odds to defeat four-term incumbent sheriff Donnie Harrison. John Arrowood became the first openly LGBTQ person elected to statewide office in NC and the south. With an eye on potential recounts in Mecklenburg, the Triad, and Wilmington, here is a first look at the 2018 NC election results.